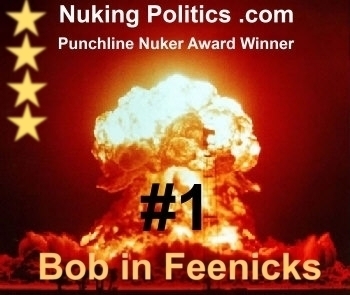 As I said last week, with Rodney Dill in the lead with 5 and Bob in Feenicks trailing him by one and two weeks to go until a we have our first Punchline Nuker of the Year, it's Rodney's game to lose. And while he did make a great effort, Bob in Feenicks out-did everyone and took the spot this week, even with a big showing from Dohtimes. Now it's officially a contest between just Rodney and Bob. Whoever wins this week will take the title of Punchline Nuker of the Year. Or...if neither wins, I'll have to make a tie-breaker decision based on what I think is the over all best punchline one of these guys made. Which will be a lot of work, so I hope one of you wins outright. May the best man taste the sweet flavor of victory.